Rice is usually divided into three general categories: long, medium and short grains. All have their special bites, textures, sizes and colours. Long-grain rice, as the name denotes, is long and thin. It has a fluffy texture when cooked, and its grains remain separate. Parboiled rice is similar in appearance and texture to long-grain rice, but has been steamed and cooked before being milled. Medium-grain rice is slightly shorter and fatter than the other types. It absorbs more liquid and has a creamier finish when cooked. Short-grain rice is very short, and absorbs an immense amount of liquid during cooking, making the end result sticky and wet. At just under 400 calories for every lOOg in its raw state, rice is the main dietary staple of half the world’s population. From standard white grains to nutty-flavoured brown, to creamy risotto rice, to the exotic wild, rice offers something to tantalise most appetites. American Longgrain: you’re bound to have this as a staple in your store-cupboard. American longgrain is the most commonly available rice, and a standard in the kitchen. White Basmati: from the foothills of the Himalayas, this rice, with the bran taken out, is full of flavour and aroma. Serve with curries or other dishes which have a sauce to mingle with the rice. Brown Basmati: the same as white basmati but with the bran left in. Use this like the white variety. Carnaroli Rice: these tubby grains release starch as they cook, which is why Italian risotto is such a great comfort food. Red Camargue Rice: this is French rice with a distinctive red colour and nutty flavour. It’s good when served with fish, meat or in salads. 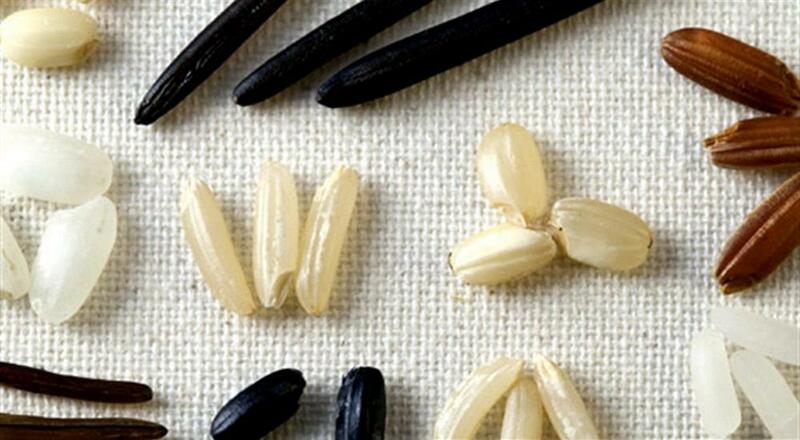 Sushi Rice: this small, chubby Japanese grain is the perfect rice for making sushi because it gets so sticky when cooked. Thai Fragrant: this is grown in the paddy fields of Thailand; it becomes fluffy when cooked and has a faint jasmine fragrance. It is delicious with any Thai dish. Wild Rice: this is not true rice but an aquatic American grass. It must be cooked for longer, but the texture is satisfying and the nutty flavour is delicious. It is good mixed with white rice, but you can’t cook the two together. Cook them separately, starting the wild rice ahead of time, and then mix them together. The highest consumption of rice per capita is in Myanmar (Burma), which is perhaps not surprising when you consider that Burma is smack in the middle of territory where rice cultivation most likely originated thousands of years ago. Radiocarbon dating of strata containing grains of rice found in south China indicates rice was cultivated as far back as 7,000 years ago. Researchers say that rice may have been indigenous to India and then moved eastward to Indochina and south-east Asia. It is amylose—a linear polymer of glucose—in cooked long-grain rice that causes it to seize up or harden when refrigerated. This is called retrogradation; the starch cells collapse, squeezing the moisture out and causing the realignment of the starch molecules. Much to the chagrin of the cook, the rice turns hard. Retrogradation cannot be avoided, but it can be reversed when the rice is reheated. Don’t keep cooked rice in the fridge for long. Cooked rice is one of the most common causes of food poisoning, brought about by the bacteria Bacillus Cereus, which develops when cooked rice is left too long in the fridge. Cooked rice should be cooled rapidly and stored in a clean, sealed container within an hour of cooking. Treat it like meat: no more than four days in the fridge. Rice is gluten-free and easily digestible, making it a good choice for infants and people with wheat allergies or digestive problems. 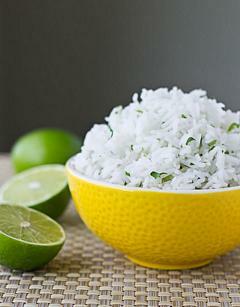 A half-cup of cooked white rice provides 82 calories; an equal amount of brown rice provides 89 calories.